Uzbekistan. Where Silk Road Grandeur Meets Soviet Funk. 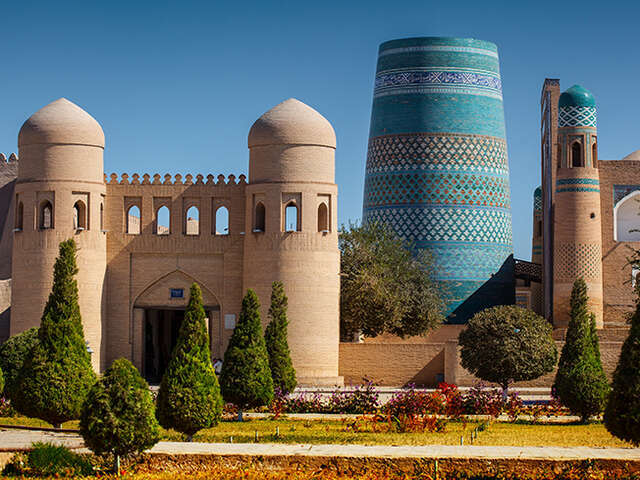 Traveling through Uzbekistan’s Silk Road cities today is like a journey through living history. Uzbekistan. Where Silk Road Grandeur Meets Soviet Funk. For over a thousand years, the network of trading routes known as the Silk Road was flush with camel caravans carrying spices, silks, people and ideas from east to west and back again. And Uzbekistan was at its crossroads. Cities with elaborate marketplaces, mosques, madrasas (schools) and courtyards were built to support traders, scholars and local populations. Traveling through Uzbekistan’s Silk Road cities today is like a journey through living history. In so many fascinating ways, the past and present live side by side. While Uzbekistan’s ancient history is rooted in the story of the Silk Road, its more recent history includes being part of the Soviet Union. This influence can still be seen in its modern architecture, felt in the occasional bit of bureaucracy and admired in its supply of funky Soviet visuals, from old Lada automobiles to hulking chunks of mid-century Soviet buildings. And if you slip just outside the tourist trails to meet ordinary Uzbeks, you’ll likely be pleasantly surprised by their hospitality and openness. Here are some of the top experiences you can have in Uzbekistan. Bukhara sets itself apart in that its historical sites are part of a living city instead of a museum-like sideshow. Vendors sell their ceramics and scarves in the same marketplaces much as they did hundreds of years ago. There’s a visual flow between colorful historical buildings and Uzbek homes, between the past and the present. It’s easy to get lost in Samarkand’s sites and architecture. When Timur made Samarkand his capital in the 14th century, he not only rebuilt everything destroyed by the Mongols, but he aimed to make it all bigger and better. Both the Registan and the Gur-i Amir, the mausoleum that he designed and where he’s been buried, are fine examples of Islamic art that draw from both Persian and Turkish influences. It’s easy to while away hours in these spaces, head tilted, mesmerized by dazzling designs and intricate tile-work. It isn’t just the stacks of fresh greens, piles of colorful spices or endless dried fruits and nut mounds that made us fans of Uzbek markets. Uzbek markets are flush with lively people, opportunities and just plain fun. So when you get your fill of beautifully tiled mosques and madrasas, be sure to visit the local food market where you will be overwhelmed with friendly offers to try fruit, nuts, and tea – and learn why women wave burning leaves to purify the grapes. Tashkent, the capital of Uzbekistan, may not offer much in terms of historical sites, but it does offer a fascinating blend of Soviet architecture and modern day big city bustle. Be sure to go underground and take a ride on the Tashkent metro system. Each station is a work of Soviet art, but photos were prohibited at the time, so you’ll just have to take our word for it. And if funky “I’m taking a break from the Silk Road” discos are your thing, Tashkent is your place. Central Asia is not particularly known for culinary prowess. 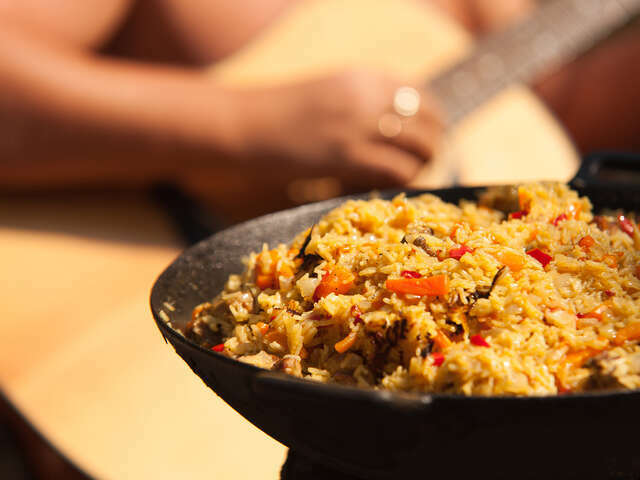 However, among the cuisines of the region, Uzbek cuisine shines on a few fronts, including the national dish, plov. Each region seems to make plov a bit differently, but the basics include slowly cooked rice, thinly sliced carrots and onions, meat (usually mutton), cumin, and saffron. Central Asian comfort food at its finest. Although more preserved and museum-like than Uzbekistan’s other Silk Road cities, Khiva offers a sort of mud-walled monochromatic romance, which is particularly effective at night. Wander the narrow streets inside the walled city and find a garden courtyard that suits your fancy for tea, a meal, or a puff of shisha. Be sure to climb up to the Islam Khoja Minaret for a great view of old town Khiva below. The ordinary people of Uzbekistan are incredibly friendly and are curious about you as visitors; where you come from, what you do and especially how you have enjoyed your travels in Uzbekistan. If you slow down, learn a few key words of Russian (e.g., hello, thank you, beautiful), and open yourself up, you’ll never know what experiences might unfold. 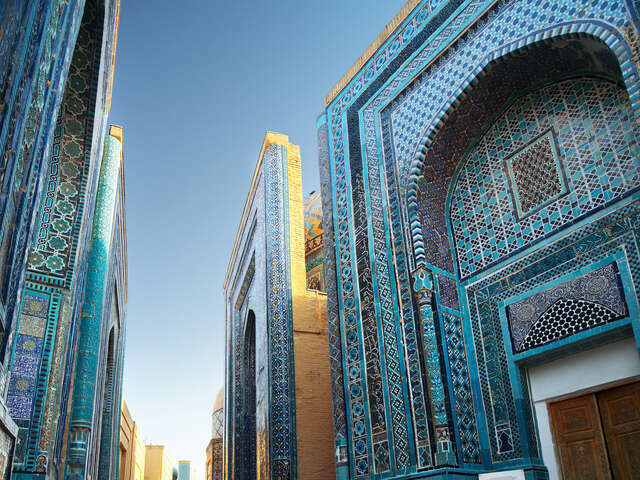 CLICK HERE TO VIEW OUR EXCITING TOURS TO UZBEKISTAN AND EURASIA!